Need a break from marshmallow peeps and chocolate bunnies? 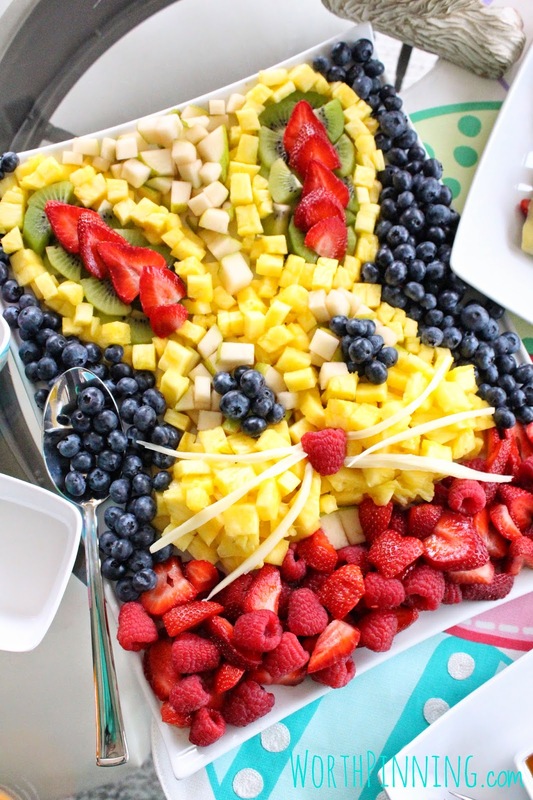 This refreshing fruit platter is a 100% adorable and guilt-free Easter recipe. Don’t be intimidated by the artistry involved, we have a step-by-step guide for how to create this tropical critter. Prepare the fruit. Wash, slice and dice the pineapple, green apple, kiwi and strawberries. Set aside two rectangular apple slices for your bunny’s teeth! To keep the apples from browning, dip them in cold water with lemon juice. Need help cutting the pineapple? Check out our step-by-step guide. Start by placing two circular mounds of pineapple side by side on the platter. These represent the fluffy bunny “cheeks.” Add two ovals of sliced apples above each circle to make the whites of the bunny’s eyes. Create bunny ear shapes out of kiwi right above each oval of apples. 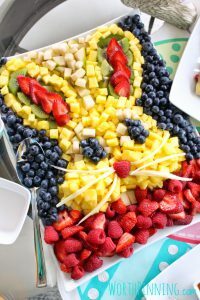 Fill in the center of the bunny ears with sliced strawberries to create the pink inner ear. Outline the ears and eyes with more pineapple to finish filling in the head. Place blueberries to create large eyeballs and a big raspberry for the nose. Place the two reserved rectangles of apples down to create bunny teeth. Fill in the background of the platter with the remainder of your fruit. It’s best to use darker fruits, like blueberries, to ensure your bunny head contrasts with the background. Add some pieces of string cheese to be the whiskers. A seemingly unlikely pair or a classic duo? Juicy, sweet and festive, pineapple and ham join forces as the main act of Easter recipes. Decorate the outside of the ham with pineapple rings and cherries to create a show-stopping table centerpiece. Need help coring the pineapple to get those perfect rings? Check out our step-by-step guide on how to use a pineapple corer. Take ham out of the refrigerator about 2 hours before baking to allow it to come to room temperature. Remove ham from packaging, then rinse and pat dry with paper towels. Place in a deep baking dish with fat side up. Combine pineapple juice, brown sugar, cinnamon stick, and cloves in a small saucepan. Bring to a boil. Reduce heat to medium-low and simmer for about 15 minutes or until pineapple juice is reduced by half. It should be thick and syrupy. Brush half of the glaze onto the ham and into the folds of the cut slices. Reserve the other half of the glaze for later. Place ham in a preheated 325°F oven and bake for 1¼ to 1½ hours. Carefully remove the ham from the oven. 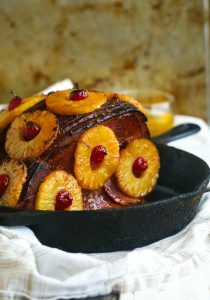 Attach pineapple rings all over the surface of the ham with toothpicks, and place cherries in the center of each ring. Brush the remaining glaze onto the ham. Return to the oven and continue to bake for another 15 to 20 minutes or until internal temperature of ham reaches 160°F. Finally, allow the ham to rest for 15 minutes before serving. While he’s busy leaving goodies for the rest of us, the Easter Bunny deserves a treat too! 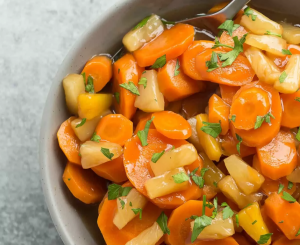 These slow cooker pineapple-glazed carrots should do the trick. Sweet with a slight balsamic kick, these carrots taste so good you won’t believe they virtually cook themselves. Toss the ingredients in a slow cooker and go dye some Easter eggs because your work here is done! In a medium bowl, combine pineapple with sugar, vinegar, salt and corn starch. Stir until all ingredients are incorporated. We hope you enjoy these fresh Easter recipes with our favorite fruit as the star! Check out our table decor ideas for an elegant Easter dinner display. This entry was posted in Recipes and tagged Easter, Easter Bunncy, Easter recipes, Easter Sunday, Easter Sunday recipes, fruit, Fruit Platter, Ham recipe, healthy, healthy recipes, party ideas, pineapple, pineapple farm, Pineapple fruit platter, Pineapple glazed carrots, Pineapple Glazed Ham, pineapple recipe, pineapple recipes, pineapples, recipe, recipes, vitamin C. Bookmark the permalink.